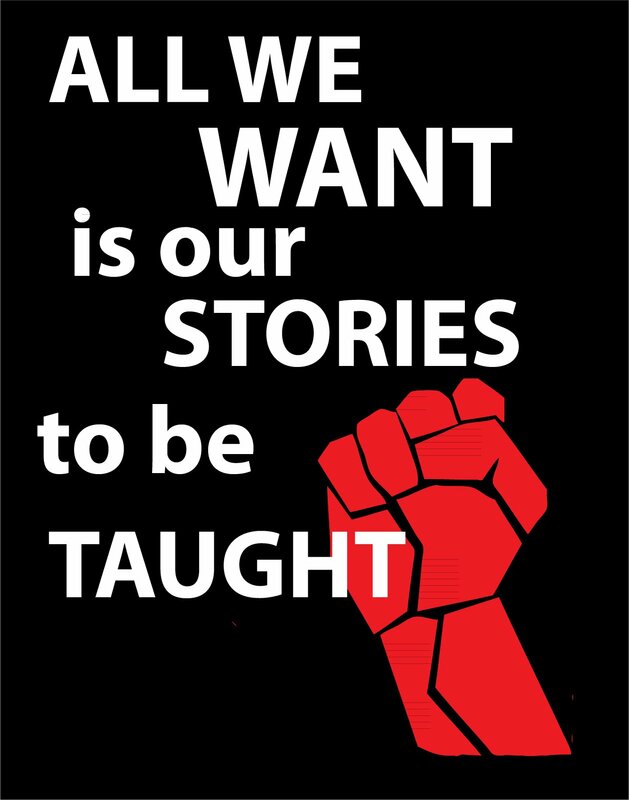 No [Marginalized] History Month: Ethnic Studies All the Time! Ethnic studies need to be engaged with attention and respect, and should lay at the core of our curricula, not on the margins. Black History Month was never something which resonated with me as a student. As a young Black person, it was impossible for me to imagine that there could ever be an allotted and finite amount of time (only a month, no less) during which the struggles of Black people around the world could be appreciated, as those struggles were a part of my every day, what I faced in my family and larger community, and which defined me to the core of my personhood. As I got older, talking about Black history as distinct from women’s history, queer history, and the struggles of poor and working people became an even more ridiculous concept. As a current school employee, I am witnessing the thick of Black History Month, the myths it reinforces in the minds of students, and the way it freezes and ghettoizes narratives which ought to be taught as complex, interconnected and alive. What follows are some of the ways in which I think the histories of oppressed communities ought to be engaged every day, all the time, in every learning community. While I speak with an emphasis on the Black history which is at the fore of my own school community right now, the very point I hope to make is that all oppressed histories inform and interact with one another, should be taught in conjunction, and should serve as tools to empower students and their communities to take action in the present, not merely to scrutinize the past. Ask questions – This, I think, should go without saying, but it continues to amaze me how many of the current pushes in education place no emphasis on asking critical questions. In fact, amongst all kinds of learning institutions the subjects of history and science are being whittled down–and is some cases, removed altogether–to make space for math and literacy practice. Curricula which place focus on critical examination and problem posing are being replaced by ones which are based entirely on getting right answers and building quantifiable skills–ones which can be easily measured on tests and presented to power as proof that the workforce is making the necessary strides to maintain economic competitiveness. While history and science as they are traditionally taught may not be fields for which I feel much resonance, it is shocking to note the rate at which they are disappearing from US learning communities. For it is precisely the monolithic and unquestionable style of learning favored by these initiatives which has erased the narratives of oppressed people from formal education, and which continues to silence them as members of traditional learning communities. A critical curriculum–one which strives to give voice to oppressed people and their histories–fights measurable learning, and does so not merely by letting teachers pose critical questions, but students as well. It presents openly the myths and contradictions of traditional learning, and calls on students to break them down, to find the holes, and to determine how they wish to proceed in questioning and challenging them. Work to make connections to the immediate community – Another issue with months or units which focus on oppressed people is that they tend to treat our histories as static, unchangeable, and long gone. They present the legacies of oppressed people as set and done, instead of allowing students to examine them as malleable, not to mention seeing themselves as part of lineages of activism and struggles for justice. Instead of talking about Black history as something that happened a long time ago, we need to imagine it as something we are still living out, and that we can each play an important role in. Examine, for example, the Highlander Folk School of Tennessee–an adult learning center for poor and working communities which became a national training ground for radical anti-racist and economic justice activism. Ask your class: What does this school and its kind of learning have to teach us about our own school? What struggles was the HFS seeking to address? How are those struggles different from or similar to those of our community? What can we do to create our classroom as one which works to actively address those struggles? Avoid sainthood – A seductive way of addressing oppressed histories is doing so through the introduction of key figures. Whether these be from the traditional pantheon (Martin Luther King Jr., Rosa Parks, etc.) or figures with which we hope to challenge the master narratives (Audre Lorde, Roque Dalton, or other figures from our own lives and studies), I find that there are a few problems which can arise with this approach. Though using the lives and roles of specific individuals can be a great foot-in-the-door to discuss the larger movements and struggles with which they are connected, we tend to choose folks whom we admire, and whose stories we hope can serve as inspiration. The result is that we often paint them in a glowing light, only focusing on what we deem to be their successes. This is disempowering, because it teaches our communities that saints are the ones who make change in the world, as opposed to imperfect people, like ourselves. In creating all-knowledgable saints, we replace one infallible history with another, making invisible the struggles inherent in every person’s life, the processes required to bring about change. Equally, we erase the communities which have made every radical struggle for justice possible. When we hold up MLK as the leader of the Civil Right Movement, we erase the queers, women, youth, poor and working people who were the movement, and who radicalized King in ways he may never have been on his own. In other words, we teach that movements are made possible by exceptional individuals, and not by the communities–like the ones we are currently a part of–which comprise them. Present hidden narratives – History, as we have all come to know it, is a linear series of events determined and inscribed by those who have written it. We challenge this limited and oppressive view of history whenever we attempt to introduce voices, perspectives and events which have been left out of it. Instead of mythologizing Rosa Parks as the tired old woman who refused to give up her seat on the bus, discuss her as a venerable and dedicated community organizer–who studied at the Highlander Folk School herself–and who was involved in radical struggles for sexual justice for Black women in the South long before she was recruited by the mainstream Civil Rights Movement. Instead of painting MLK as a benevolent advocate for peace, talk about how Huey P. Newton was the first major Black leader to publicly declare solidarity with the Gay Liberation Movement–something MLK never did. Better yet, talk about Black History as something which has been happening across the planet for centuries, not just in the US during the 1950s and 60s. Bring to the table the stories and ideas which have been intentionally written out of history, and allow the community to grapple with them from their own perspectives. Focus on specifics – The exact problem with an event like Black History Month is that it tries to condense a complex and expansive set of narratives which have shaped the face of our planet and lie at the root of our hemisphere’s inception, into a series of stiff lectures and forced projects. Instead of placing the histories and perspectives of oppressed people at the foundation of a critical education, it tacks them on disjointedly, rendering their radical legacies impotent. The result is not only the insulting of these powerful histories, but also their gross simplification. When we try to talk to kids about Black History in a month, the Civil Rights Movement in one sitting, or Black Power in one speech, we inevitably end up cramming huge spans of wisdom and information into cramped lessons which do them no justice, and which often confuse and overwhelm kids rather than empowering them. Instead of trying to squeeze whole histories into windows which could never contain them, give them the time and attention they deserve. Try to teach smaller moments with specificity and complexity, rather than simplified versions of huge spans. Instead of doing a unit on the Civil Rights Movement, teach one on a specific event, like the Children’s March. Spark a conversation on the incredible power and responsibility that young people can wield, and take time to delve into that rich discussion, instead of rushing past it in an attempt to cover an entire movement in a week. There are reasons why ethnic studies are under attack around the globe–why the powers of Arizona are slashing classes and limiting access to texts which address and empower the histories of our people. The legacies of the oppressed always shed new light on the systems which oppress them, and the very methods which they devise to survive those systems are blueprints for how to dismantle them. We fool ourselves into thinking we are doing right by these histories when we mythologize them, gloss them over, and speed through them in our learning communities. Only when these histories are allowed to speak–are treated as serious areas of study which lie at the core of the curriculum–and are let to breathe and interact with one another, and with the members of our community, can they truly begin to teach us our roles in continuing on their legacies, and of challenging power in our own historical moment. This is such wonderful wisdom. Thank you! Georgians for FReadom put together a conference with teachers and students from the Tucson district where this horrendous ethnic studies/book ban is going down. Some things I learned from them are a. what an amazing exemplary Chican@ Studies program they have founded in their high schools, b. that this is a veiled witch hunt of Chican@ teachers/ teachers of Chican@ studies, and c. that this type of legal ban on studying race has the possibility of sweeping the country similar to their SB 1070 anti-immigrant law which has reached many states and has gone further in Alabama for example in criminalizing k-12 youth and putting them through e-verify in order to enter the classroom. One important and moving story I heard was from a hs senior who is currently enrolled in three Chican@ Studies courses. Essentially, a significant amount of his work and his entire high school focus has been made illegal. He has to fear for his teachers being disciplined and fired, his work being censored, and watch as state officials enter his classrooms and seize his books. I love your tips for empowered learning. I think they especially mean so much in a national climate that seems to my eyes to be growing increasingly violent toward children, incarcerating them, deporting them, absence of helpful response to DV and CSA. Something that strikes me about this ban, and the race war it presents is that it enables the white supremacist state to criminalize a whole new segment of students of color, organizers and resisters. There are already mechanisms in place to criminalize poor students (busing, dress code, absences, to-prison-pipeline, etc. ), disabled students (underfunding, bullying, lack of attention in curriculum, etc. ), undocumented students (e-verify, deportations, english hegemony, etc. ), queer students (bathrooms, straight normativity and bias, etc.) and so much more. But now there’s another way to criminalize potential resisters, even if they’ve never had a problem with the school system before. Just take away their entire academy! The number of youth that aren’t being criminalized in schools is getting smaller and smaller. My structuring of that idea made it seem like I believe these groups are separate, but they aren’t. These mechanisms of oppression all overlap, if not entwine completely. I said “etc.” in each example because I know that I am undercutting each and every issue. I don’t know how to write in a way that will really grasp the magnitude of what this means for us. Thank you for your thoughtful and detailed responses, and for your feedback. I’m really glad to hear that there are discussions and meetings happening in so many different places around the truly terrifying events taking place in Arizona. I think the link you make between the criminalization of oppressed students by the public school system, and the more recent criminalization of their histories by that same system is an important one–one I hope to think more about, and which we should all be paying close attention to. I think that schools are often telling models of the dynamics which are occurring on larger scales, and the ways in which one efficient and hegemonic system can violently silence so many voices and communities in succinct motions is unnerving, but also the nature of the structures we are navigating, and something we can learn from. Thank you so much for reading, and good luck to you and the groups you are involved with!